Sunshine, Coco and Miss B delight and inspire audiences both young and old with their rich harmonies, uplifting arrangements, multi-instrumental talents and audience interaction. Using a range of acoustic instrumentation – from marimba to melodica, guitar to cavaquinho, washboard to kazoosaphone – the Curly Cousins introduce melodies and rhythms from a broad range of music traditions, within a fun and familiar context. The Curly Cousins — also known as Rochelle Wright, Mandy Morris, and Laurel Cohn — have a combined wealth of experience as performers and recording artists in various bands and theatre companies over the past 20 years, and have worked in the early childhood music sector as teachers and performers since 2002. Guided by a desire to encourage the creative spirit in children, the Curly Cousins capture the imagination of everyone who is young at heart. Experience the Curly magic! Email us to join our mailing list — find out about upcoming performances and Curly news. 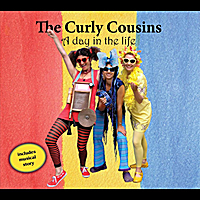 The Curly Cousins CD A day in the life features original material, some well-known songs with the Curly touch, and a 25 minute musical story. With over 60 minutes of listening time, this CD will entertain and delight all who are young-at-heart. The Curly Cousins are joined by some outstanding musicians for this release and parents and older siblings will find themselves drawn into the music and fun. The Curly Cousins Colouring Book – A day in the life is now available. Enter the world of Coco, Miss B and Sunshine and be inspired to colour and draw. The lively line drawings follow the story of a day in the life of The Curly Cousins. The perfect accompaniment to the CD ‘A day in the life’.